Following hot on the heels of the Super Mario Gold Edition amiibo is the slightly less precious Silver Edition. This isn't a massive revelation, as they were spotted only last month on a Chinese website, but regardless this will come as good news to those who missed out on the Gold Edition... or simply must collect 'em all. 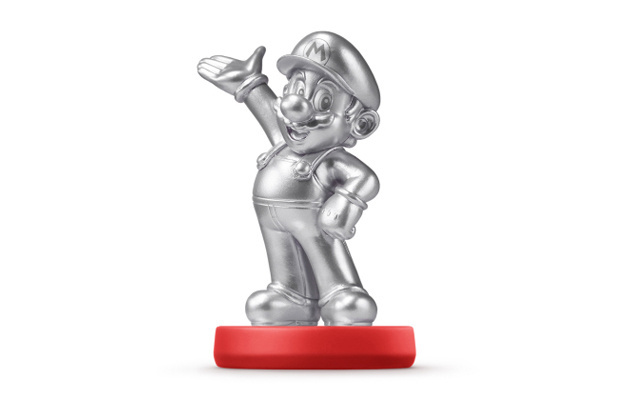 The Silver Mario amiibo will have the same functionality and work with all games that are compatible with Mario amiibo, so buying this is really an expression of personal preference. Nintendo of America has announced that the Silver Edition amiibo will be in stores across the U.S. on May 29th. We're yet to hear what plans there are for other regions. Will you be first in line to pick up a silver Mario amiibo? Did you have any difficulties obtaining a gold one? As always be sure to share your thoughts with a comment below. And it was up for preorder on Amazon.ca yesterday... Got my preorder in. I was able to get a Gold Mario after standing around my nearby Walmart for three hours before it was officially for sale. I'll probably wind up getting a Silver one, it depends. Don't care. Restock the old Amiibo instead of more versions of Mario. May 29th? Isn't that the day that Splatoon releases? If so. Does this mean that the Silver Mario Amiibo will be compatible with Splatoon? Or is it the Splatoon only Amiibo that are compatible??? @PHDragoon How much is it? Being in Europe I'll probably have to buy one off amazon but I'm hoping I won't have to pay scalper price. @Starz It was $15.99 before taxes, which is the regular price for amiibo in Canada now. My Walmart screwed me over with the gold Mario by "forgetting" that they had gotten their stock until about 12:30 that afternoon (I'm a teacher, so I had to be at the school at 7 and didn't leave until 4), so I had to drop $50 getting one online. I intend to get my damn silver Mario this time. When is it going to be up for preorder at Amazon in the US? They don't even have a coming soon listing for it. This is the only way I would get a Mario amiibo. But it will be very hard to get. @PHDragoon Wow well done good price too. Didn't we already cover this extensively 2 weeks ago? Or was that just the rumour and this is official now? @Takerkaneanite6 - We covered that too. Maybe they'll offer the silver Mario amiibo free w/ Splatoon since we're paying $60 for the game and the UK is paying 39 (=$62US) for the game and squid amiibo. I'm still betting on it unlocking silver paint in the game. How cool w/ a metaliic silver paint look? Or F.L.U.D.D., I'd be ok w that. Back in my day, we would have called that "Metal Mario"! WHAT ABOUT EUROPE AND AUSTRALIA? Looks a bit like a player's token in Monopoly. Silver Mario, Wave 4 amiibo, Splatoon game, amiibo and system bundle all on the same day. Hard to tell if the stores will be painted green with cash or red with blood. @ekreig haha, Indeed it would be. The day I went to Gamestop to preorder Ness and Pacman and everything crashed on their servers and I wasted so much of my time....Yeah, that was the day I quit caring about amiibo. After getting the Smash Mario, the MP Mario, and the Gold Mario, I ain't in a hot rush for a silver one. I'm patiently waiting for the new waves instead. Nintendo sure is running with the "Leave luck to Heaven" concerning amiibo. Lol I'm getting a Silver Mario, but this is like what? The fourth Mario variant? The worst part is that three of these variants are nothing more than palette swaps, as they all read as SMB Mario (at least in the case of Hyrule Warriors) time to plan out a Silver Mario could have been used for another reprint. Though I suppose that maybe some of the SMB Mario allocation was used for re-paints, being that it uses the same mold. @rjejr I'm with you on the silver paint. I remember half joking a good while back (I think with you) that Nintendo would probably make Gold Mario unlock special gold paint in Splatoon, just to ruffle people's feathers because of the lack of Gold Marios in the wild. Since it doesn't have a unique feature I wouldn't be interested but I'm glad they aren't store exclusive. @rjejr Yes, but if we want all the amiibo and the game, Amazon is charging us £69.83 ($110) whereas you can get the same at best buy for $96 (£60). They give with one hand and take away with the other. It's the high cost of amiibo that does it for us. They are usually £12-20 each and that's from the regular retailers. Using Ebay, you're looking at £40+ per figure because there simply isn't any stock. Gold and silver Mario not even scheduled to be released!! The Splatoon thing is weird though because EU is usually more expensive in EVERY way and it doesn't make any sense why US pricing is that high just for the game. And it would be cool to have silver paint!!! @Sir_JBizzle - "just to ruffle people's feathers because of the lack of Gold Marios in the wild." My kids can put their gold and silver Marios on the shelf next the to the King Dedede and Metaknight they never got for Kirby and the Toad they never got for Captain Toad. We'll call it "The Emperor's Clothes amiibo Museum". Hopefully I can get one, but i doubt it. But honestly I've never seen Toad on a store shelf. I'm in Target usually 2x a week and Gamestop every other week and I've rarely seen anyone other than Mario, Luigi, Peach, Link, Zelda, DK, Diddy, Pikachu, Bowser. Back before Christmas there was Samus and Starfox, but not since. I still think Splatoon amiibo will be available b/c they'll make plenty to support the new IP, but I suppose the scalpers could still scoop them all up. But even if the scalpers DO buy them all, if there are enough of them the price should still be fairly low on eBay. Skylanders Kaos Trap was going for $80 on Ebay, once they released more a month or so ago the price plummeted in a day to about $12. Even eBay has to abide by supply and demand. I've got an extra Toad I can sell you, new in box, if you cover shipping. Splatoon is STILL available for pre order on Walmart website. Yes they'll be common but could still sell out in stores. Pre order now if you don't wanna have to resort to eBay. @JaxonH - You better hang onto that Toad in case you miss 1 of those store exclusives and need to trade it. Thank you very much for the offer though, appreciate it. Now you better delete that post before you get flooded w/ requests. No seriously, you should delete it. I mentioned to Capt Gonru this morning I'm giving up on Spaltoon amiibo and just getting the game. Hopefully the weapons we get are more "Skin" than anything else and I can still play online w/o them. I don't care what my squidling looks like, that game is too fast paced to be looking to see what anybody is wearing. I read somewhere you missed the stress test last weekend, but yes, it is as good as you've read. The OP roller could probably use a little tweaking, but I think they need to give the game a few weeks to see how it really goes, roller folk may just become sitting ducks once everybody figures out the best camping locations. Couldn't really learn anything in those 3 1 hour increments. Roller won't do much good in those moving tower levels. @Grumblevolcano - "why would you release non-Splatoon amiibo on Splatoon's release date?" I'm actually more worried about the opposite happening. All the amiibo eBay scalpers show up at stores looking for Wave 4 amiibo, see the Spaltoon amiibo that they didn't care about b/c they aren't a "Wave" but buy them anyway just to resell even though they have no interest in the game. My point being - Splatoon amiibo may have had a better chance remaining on store shelves not being scooped up in bunches by scalpers if Wave 4 released on a different day. Either way, your bad outcome or mine, it does seem like a bad move. It only turns out well if there are enough amiibo for everybody who wants them, but that just wont happen. Fortuantley I gave up on Splaton amiibo this morning, I'm just buying the game and that's it. @rjejr Toads are actually up for sale on Walmart dot com actually! http://www.walmart.com/ip/i/43086184?affwt=top&u1=&oid=223073.1&affjs=1&wmlspartner=AKGBlS8SPlM&sourceid=14039103532199048396&affillinktype=10&veh=aff He's not far too rare, so he's available if you want him. Toad's amiibo looks great, I have one myself! So, when does Europe and the rest of the world get Gold and Silver Mario's? I'll trade for one of my Japanese Club Nintendo SNES Classic Controllers. Not really into the main guys (that's why I didn't get Mario or Link) but I have to admit this one looks pretty cool. I would've preferred restocks of rarer amiibo though. Same day as Splatoon? Well it's not exclusive to Walmart at least. Tbh I only really cared for the gold one for the novelty of it and certain comedic factors. Still angry over that debacle either way. As much as I'd LOVE for Europe to get both of the Gold Mario amiibo and the Silver Mario amiibo, I am quite satisfied with owning 70% of the really hard to find Super Smash Bros. series. @TreesenHauser Well, damn. If you waited three hours in line for Gold Mario, then no doubt you're getting this. There's no 'it depends' about it. @Porky Well, okay, but if there's a stinkin' Bronze Mario I'm done. @TreesenHauser I'm with you there. Excluding Dr. Mario and maybe Tanooki Mario lol. North America, availabilty will be probably be better than the gold ones will get silver Mario's. Hopefully we will get some thing nice when Mario hits 30. @ekreig Back in our day, we would've posed him in a disco position. Must have it!! I would be willing to trade anyone else a gold Mario for the silver if I'm not able to get one! Eh. Should've been Luigi, tbh. @ekreig Speaks my mind, and it's by this logic that I might would eye one. @ChuJelly - I clicked on the Toad Walmart link but all I got was an Out of Stock message. Out of stock hardly counts as being available if we want him. And the Amazon link at the top of the page - I have some weird Amazon thing in my browser - says Amazon has it for $19.99 from a 3rd party. But my oint still stands - if Nintedo wanted to market these as limited edition collectibles - Time is running out! - and of all that marketing hyperbole, fine. But they've never marketed them that way, they've only marketed them as toys comparable to Disney Infinity adn Skylanders. Kids shuldn 'thave to hunt for thier toys. Kids should be able to walk into the store of their choosing and pick which one they want off of the shelf, taht's how toys work. Now I've been a father long enough to know that Christmas shopping for that 1 special gift can be a nightmare - Beanie Babies, Tickle Me Elmo, Cabbage Patch Kids - but this is the middle of May, nobody is Christmas shopping, or Hanukah or Kwanzaa shopping, If Nintnedo can't keep their TOYS in stock in MAY they are doing it very wrong, plain and simple. @rjejr Except Toad WAS in stock online when I made the comment 19 hours ago. Just not anymore. You were too slow at noticing the comment I guess. Toads sell out often online it seems, though I've seen quite a few Toads in stores. I just picked one off a Gamestop shelf no problem on a random day a few months ago and it STILL shows stock of him for that Gamestop by me. Maybe check Gamestop store availability online near you? @ChuJelly - I think my kids may have just given up on amiibo at this point. And Lego Dimensions is coming. i think that's where all of their allowance money will be going for the next couple of years at least.